The City of Oakland set out to make an impact on residents’ lives by modernizing its digital services and increasing digital inclusion, especially to underserved populations. With OutSystems, the development team delivered an impressive eight apps in just 12 months, including the single sign-on OAKAPPS portal at the centerpiece of the transformation. Not only were they able to develop each app in weeks versus years, but they saved the city an estimated $1 million—all while improving city services to residents. Challenge - The City of Oakland had some catching up to do. It recognized that residents expect more modernized services, like the apps they’re accustomed to using in their everyday lives. But the city’s systems and processes were old and outdated, and most required residents to complete forms manually and in-person. Because not all residents have the time, transportation, or childcare support to visit city offices during business hours, the manual systems were a deterrent for residents to make that effort. Oakland wanted residents to be able to reach city services from the comfort of their own homes and maximize the use of services their tax dollars support. Getting it done was another story. A team of five developers had to deal with legacy systems that were not always updated or even supported regularly, which meant projects took too long and frequently failed. The team needed to bring digital services to market, gain quick wins, and rebuild the credibility that would widen their scope and their impact fast. Solution - The answer was building OAKAPPS with OutSystems, a resident-facing, single sign-on portal that houses all new and future city services applications. Having previously succeeded with OutSystems in the private sector, CIO and CTO Pete Peterson knew it would be the key to building the OAKAPPS portal and individual apps quickly and successfully. To kick off the transformation and familiarize the in-house team with the OutSystems platform, Oakland partnered with OutSystems Elite Partner Do iT Lean to bring the OAKAPPS portal to market. During the first year of using OutSystems, the Oakland team delivered apps developed either entirely in-house or with OutSystems partners, giving them the flexibility to pull in additional resources when needed to accomplish their goals. 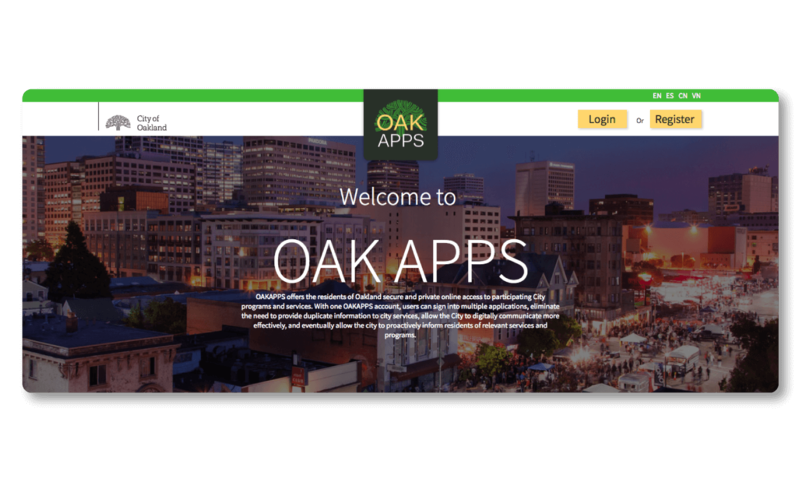 The OutSystems platform allows the city to keep adding new apps to the OAKAPPS portal over time to serve more residents in more ways. Rent Adjustment Program (RAP): Helps residents report and combat rent rates that are raised unfairly by filing a case and tracking it through the system. Police Review Agency (CPRA): Replaces paper-based processes for filing complaints against law officers, uploading video documentation, and following the case through the system. OutSystems Partner Do iT Lean helped deliver this app. Planning and Building Docs: Allows contractors and developers to upload documents for review, simplifying the permitting process and reducing wait times. Zoning Check: Allows residents to easily check zoning in an area where they wish to open a business. Business Permits Check: Makes it easy for residents to find out which permits they need for a new business idea. 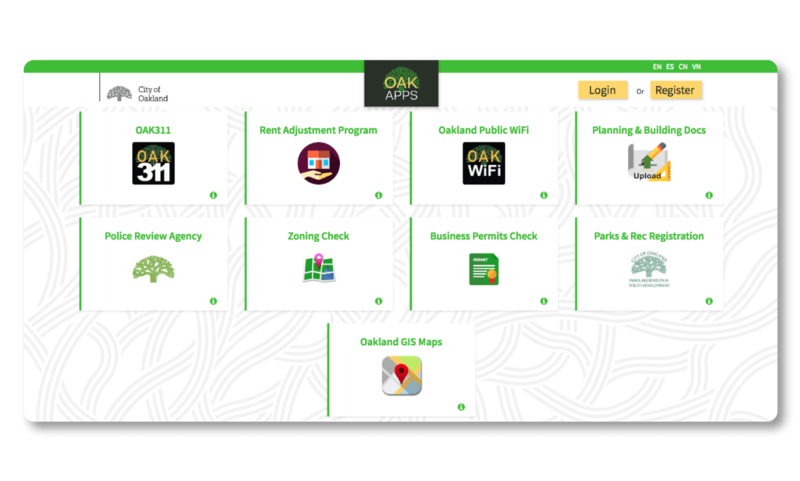 The OAKAPPS portal also provides all residents with access to services like public WiFi, Parks and Recreation registration, and OAK311 for reporting non-emergency issues. Results - In just one year, Oakland delivered an impressive eight apps, boosting the internal development team’s credibility and resulting in 14 new apps being added to the pipeline. Peterson estimates that by using OutSystems, the city has saved years of development time and close to $1 million, in part by bringing more projects in-house and by canceling expensive third-party subscription fees to support legacy apps. OAKAPPS gives residents modern access to city services and greater visibility into the services their tax dollars are supporting. By making these applications readily available to residents, the city is democratizing access to its services and technology. Adoption of the online services by residents is steadily rising, with about 1,100 users in the first few months and 10% of the population expected in the near future. In addition to resident-facing applications, the city has also developed a number of internal solutions that streamline processes and save budget. For instance, the Police HR Management application was developed in-house, saving 75% of the initial budget allotted. In the next 12 months, the Oakland development team plans to deliver a new crop of applications and capabilities, including Resident Relationship Management, which allows them to use analytics about each resident to market relevant city services to them. Also underway are a Housing Assistance app with OutSystems Elite Partner Truewind, which will help provide residents with affordable housing, a Volunteer Management system to help residents become more involved in the community, a Liquor Licensing app, and a special Permitting System for fire safety.